I promised my perspectives on the Groundwater Foundation at the end of the first installment of this blog. It is surprising to realize that relationship is measured in decades. To begin with, I was wrong. Not all the time, but certainly at key turns in my journey with the Groundwater Foundation. I first encountered Groundwater Foundation, like many Nebraskans, at the Children’s Groundwater Festival. I don’t remember if it was the 1989 or 1990 Festival, but I was participating with the Nebraska USGS team and thinking that this would be like our usual outreach events. That would be 10-30 participants for a class, a Scouting group, or other organizations. I was totally unprepared for the Festival that would eventually be replicated at over 40 other locations. 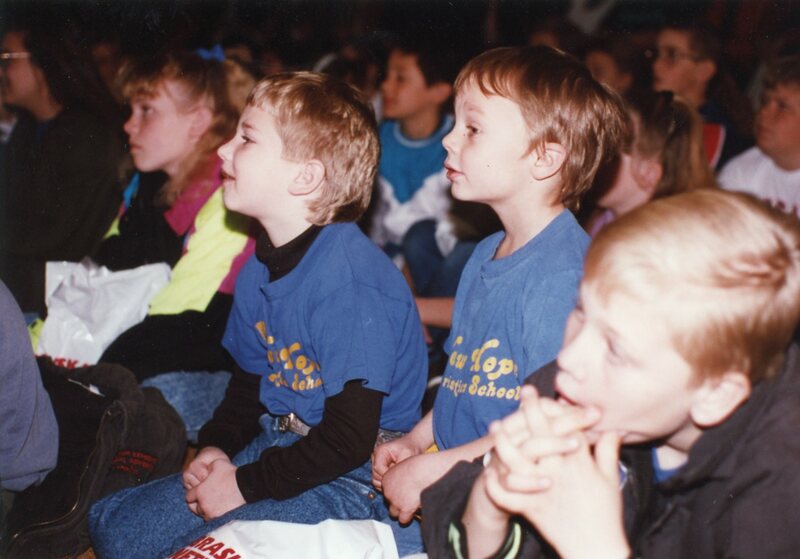 It was usually difficult to get students enthused about science, in general, and groundwater, in particular. I was wrong. Hundreds of students went through presentations all day long. They were excited. They had fun. They were engaged. That certainly wasn’t my last Festival and I was never surprised by the enthusiasm of a Children’s Groundwater Festival again. Participants at an artesian spring at Groundwater University in 1995. Fast forward a few years and I was participating as faculty in Groundwater University while stationed at North Platte, Nebraska. The idea of dedicating a week of time to accompany teens wasn’t foreign. I did that pretty often with my son’s Boy Scouts Troop. However, making the jump from one-day festival to week-long full immersion (pun intended) experience. That, I thought, was well too deep to pump and I selfishly wondered if I’d be bored that week. Wrong again. The team of faculty, volunteers, and staff that Groundwater Foundation assembled for Groundwater University created an experience that few actual university students were receiving at the time. I found a kinship in the common interest, learned more than I thought possible, and came away refreshed instead of exhausted. Bob Swanson receives the USGS Groundwater Guardian plaque in 2008. North Platte was also my first experience with a Groundwater Guardian Community. 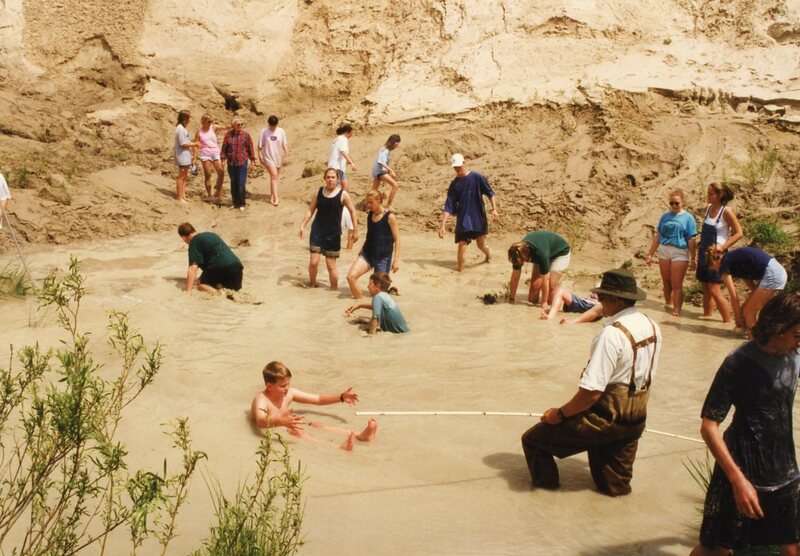 My USGS Science Center was an affiliate, but I was involved with the community team in North Platte. I’d belonged to a few community-based volunteer groups in the past and my initial thought was that none of them produced much more than a membership card and I fully expected to pay my dues and read the newsletter. I reluctantly admit that I was wrong, yet again. I was introduced to those Results Oriented Activities (ROA) and found we had to actually do good things and proved that we did them. Imagine that....productivity and accountability. Following a few years in a location without Groundwater Foundation interaction and upon accepting the position of Director of the USGS Nebraska Water Science Center I found myself involved in an early tradition of the USGS Nebraska Water Science Center and the Groundwater Foundation. One of my duties, as Director, was to visit Congressional staff and report on the activities of my Center. Early in Groundwater Foundation’s history, Susan Seacrest, founding President of the Groundwater Foundation, began accompanying the Center Director on those visits to leverage interest in groundwater science and to visit with leadership at our national headquarters. Jane Griffin continued that tradition when she became President of Groundwater Foundation. I would prepare to try to communicate in a 10-15 minute period the progress of the previous year’s science activities for a USGS Science Center. I could only focus on so many things. It seemed inevitable that I would pick projects and programs that the Congressional staff already understood. Susan and Jane have an innate insight into people and I found myself always focusing on the science. They would always point out the projects that connected critically with the people that the Congressional staff represented. Now maybe I wasn’t wrong, but I wasn’t focusing on the right thing and Groundwater Foundation helped me to learn that lesson. I found that insight to be invaluable. That leaves me proud to be wrong. One last observation is that I never met a Groundwater Foundation employee that I wouldn’t count as a friend. Thanks, Groundwater Foundation. Robert Swanson was Director of the USGS Nebraska Water Science Center (NEWSC) from 2004 until his retirement in 2017. The NEWSC has 40 dedicated water science professionals, support personnel, and students and offices in Lincoln and North Platte, Nebraska. He oversaw a science program that is managed through two sections, Hydrologic Surveillance and Hydrologic investigations. The USGS operates over 130 streamgaging stations, about 70 continuous groundwater recorders, and compiles ground-water levels for over 5,000 wells in Nebraska. Prior to 2004, he gained a wide range of experience in the Hydrologic Surveillance (Data) Section as a hydrologic technician and hydrologist in the Lincoln, Cambridge, Ord, and North Platte Field Offices. He served as field hydrologist for the National Water Quality Assessment (NAWQA) program's Central Nebraska River (CNBR) Basins Study Unit research team and later as CNBR Study Unit Chief. From 1999 to 2004, Bob was assigned to the USGS Wyoming Water Science Center as the Chief of Hydrologic Surveillance. He has also been Acting Director for both the Iowa and Missouri Water Science Centers. He has served on numerous committees for the advancement of science and technology in the USGS, as well as business practice committees.